Ryan made a little video of my padres puppies. Ordinarily, the release of a new vinyl is enough to get us interested, but the new strategy with this year’s RunDisney figure really has our interest piqued. First up, the mundane – the figure will be released on both coasts on January 10th, and he’ll be retailing for $12.95. Pretty cool, right? It’s a runner Mickey, dated, with a spot to write or paint in your finish time. Here’s the interesting bit – also releasing on January 10th (only at the WDW D-Street) are three individually sold accessories. MIND BLOWN! How cool is that, ‘Nation? 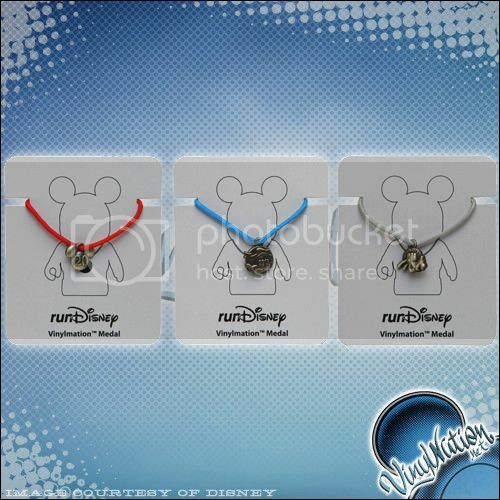 Now, enterprising runners can pose with their prized finisher medals next to their very own runner Mickey Vinylmation in his prized miniature medal! 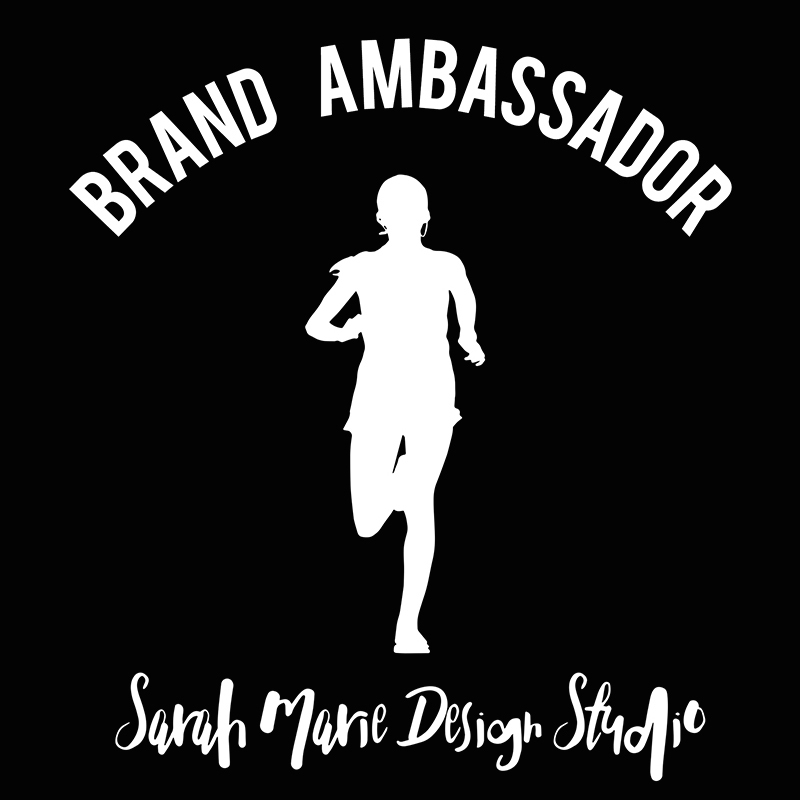 No word yet if other races will receive the same mini-medal treatment, but I know I speak for a lot of the runner in the VinylNation community in saying, make them for the Tower of Terror Ten Miler and the Wine and Dine Half! Plus, if this approach proves successful, could we one day see individually sold Vinylmation accessories? Folks have long asked about replacing missing lightsabers or axes or hats, although the $1.95 price tag may seem a bit steep for those sorts of items. Time will tell in 2013! 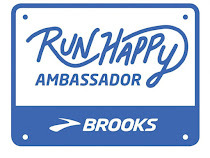 I am excited to let you know the Happiest Race on Earth just got happier! Today runDisney announced the 2013 Disneyland Half Marathon Weekend is expanding with the addition of the Disneyland 10K at Disneyland Resortin Anaheim, Cal. The new 10K will be a timed event and take runners through Disneyland park, Disney California Adventure park and on the streets of Anaheim. As with all runDisney races, participants will receive a newly designed finishers medal. Runners looking for a bigger challenge can register for the Dumbo Double Dare. A limited number of runners will have the opportunity to take the dare and run the Disneyland 10K on Saturday and the Disneyland Half Marathon on Sunday – 19.3 miles total. 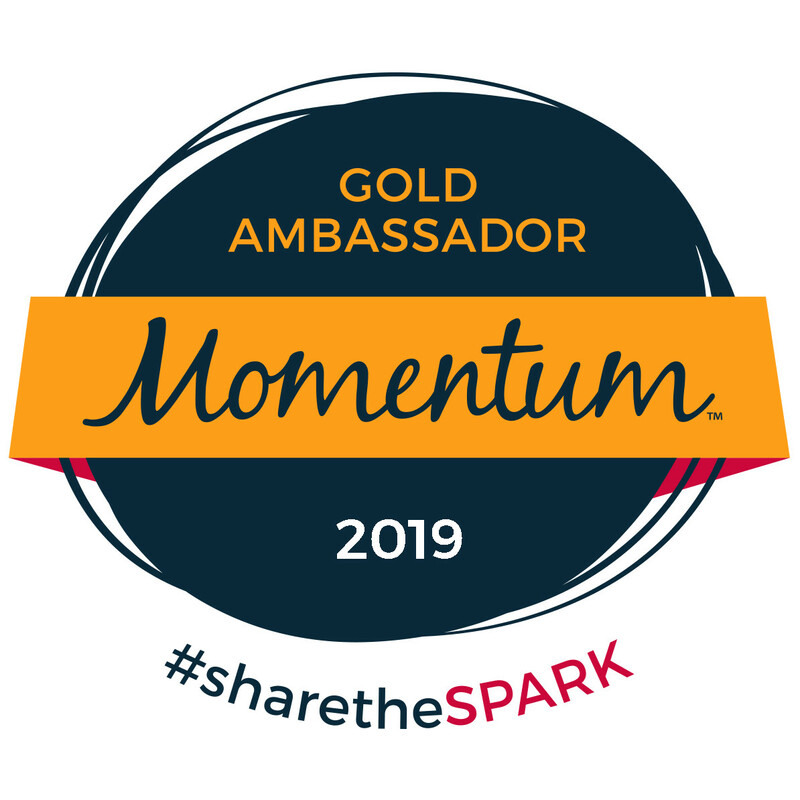 Finishers will receive a special finisher medal to help celebrate their accomplishments, in addition to the half marathon and 10K medals. The 10K is one of the most popular race distances for runners, next to the 5K and half marathon. With race weekends featuring kids races, 5K, 10K, 10-Miler, half marathons and a marathon, runDisney offers runners at every level a chance to experience a runDisney event, run through Disney theme parks and earn coveted Disney medals. 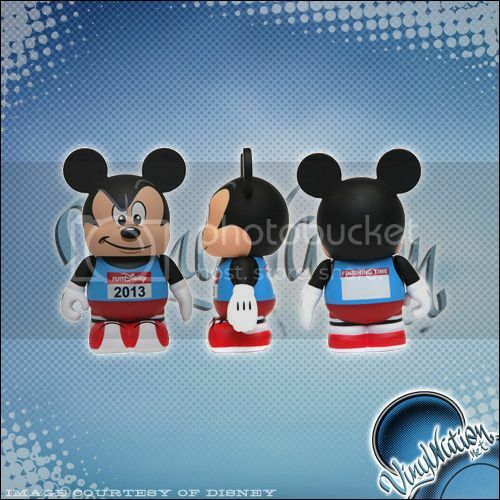 Registration for all Disneyland Half Marathon Weekend races opens on January 22, 2013. Last year, the popular half marathon sold out in little more than a month, so I encourage interested runners to act quickly. For more information about the race weekend and other runDisney events, go to www.rundisney.com. On behalf of myself and some special friends in the video below, I invite you to join us August 30 – September 1, 2013, at Disneyland Resort. Officer Tom Wenzl came out of the woods recently with a story he never expected. He used geocaching to find more than a cache. 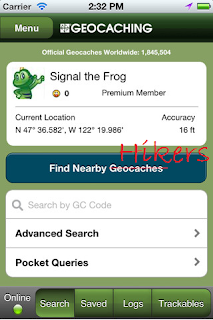 Officer Wenzl used his Geocaching iPhone app to locate a lost hiker. The police officer in Washington State, USA is an active geocacher along with his wife. They use the geocaching username VonDeets. 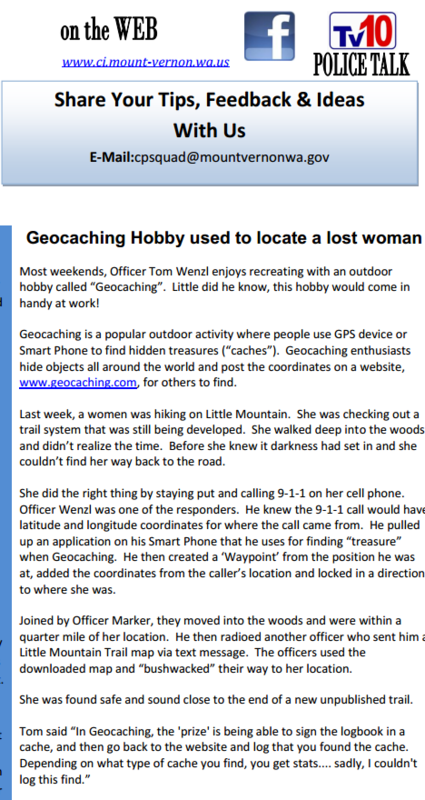 Officer Wenzl reportedly used his Geocaching App to plot a Waymark based on coordinates recorded by the lost hiker’s 911 call. Police could not have used traditional maps. The area where the hiker was lost had not been mapped. 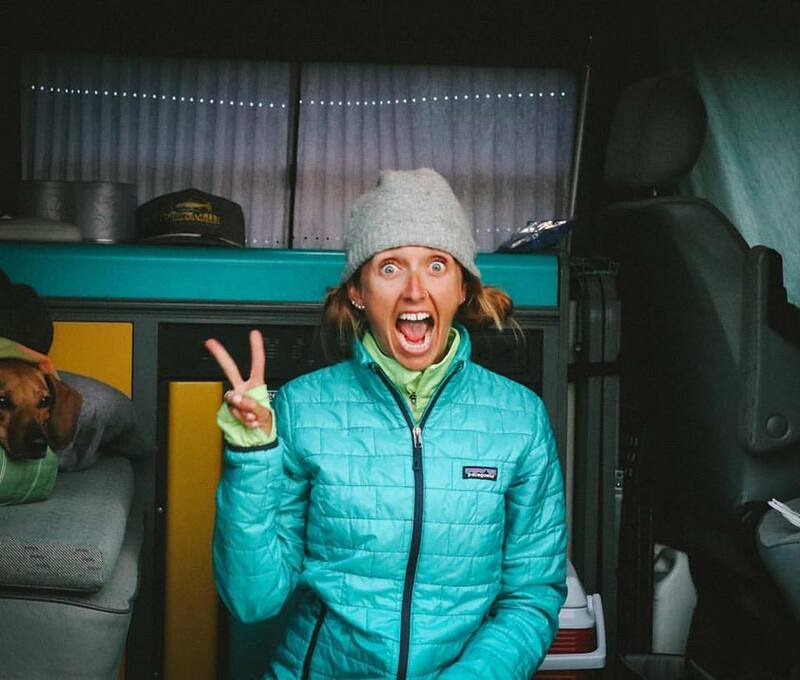 After a short search, the hiker and her dog were found safe. Check out the article to the right in the Mount Vernon Police Department newsletter for more details. The story of Officer Wenzl’s creativity and determination has also been picked up by local media, including this local newspaper. His geocaching partner and wife, tells Geocaching a local TV news station is also planning to interview Officer Wenzl. Thanks Officer Wenzel for being an excellent officer and geocacher! Have you ever had one of "those" runs? One that you just can't get into your groove? One that nothing seems to be going your way? One that seems to leave you in a bad mood even after you finish it? Well, that was what my race was like yesterday morning. It started off on a bad note and just never got much better. They were going to start us in waves. The first wave was going to be those runners with 8:00 minute mile pace and faster, the second wave (which I was in) was runners with 8:01 to 10:00 minute mile pace, and then the third wave was runners with 10:01 minute mile pace or slower (plus walkers, strollers, etc). So when they told us that the first wave was getting ready to go I turned on my Garmin to locate satellites. Little did I know that we were all taking off in the first wave, so my Garmin didn't "find" me until maybe .1-.2 miles into the race and I felt like the start was a 'surprise'. Then, I couldn't get into my 'groove'. My pace was slower than my recent training runs. I don't know if it was because it was later in the day than most of my other races (a 10am start instead of 7am), if it was because the course was a lot hillier than I expected, if it was because of my lack of fueling before the race, if it was because my legs were tired from my training the few days before, if it was because of the heat and humidity, or if it just wasn't my day. Not to mention, the course wasn't a closed course, meaning it was still open to the public. So throughout the race we would be on a small sidewalk section (the course ran along the bay, so it was sand on either side of the pavement) and there would be random families of bikers or walkers that were just cruising at us. And in their mind we were just in their way... So not only were you having to weave around people in the race, you also had to dodge random people that were just out and about on their Sunday morning strolls in the park. I had my photographer and cheerleader Ryan there with me. He took some pictures and tried to keep me motivated by saying things like 'At least you finished'. Below are some of the pictures that he was able to take (at least the pictures look like I am having a good time, hehe). All with their voices - AMAZING! Pentatonix made their Tonight Show debut on Dec. 14, 2012 and performed "Angels We Have Heard On High" from their Christmas EP "PTXmas." Ryan and I went up to Disneylad last night to see all of the fun Christmas lights. We had just been a few weeks ago, but we went on a Sunday, so it was during the day and we didn't get to enjoy the parks lit up. 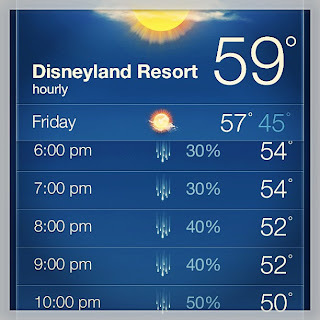 Although it was raining and cold, we decided to weather the weather (hehe) and go anyway. It actually kept most of the people away, so we scored! Ryan loves to do the Animation Academy, where you get to learn how to draw some of the Disney characters from actual artists. After we finished watching Prep and Landing we went over to see who we could learn how to draw. Ryan was really hoping for Frankenweenie, but the woman I spoke with thought he was just a seasonal character. But we got to learn how to draw another seasonal character - WAYNE FROM PREP AND LANDING! And we only had to wait about 3 minutes before the session started. This was working out to be quite the perfect evening. 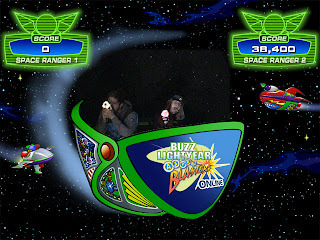 After our artists skills were complete we decided we wanted to walk through Cars Land, since we had never actually seen it at night with all the neon glowing. On the way we saw Goofy and Pluto. Goofy had to go, but on the way out he gave both Ryan and I big kisses. We were able to snap a few pictures with Pluto (which Ryan said he liked more anyway). 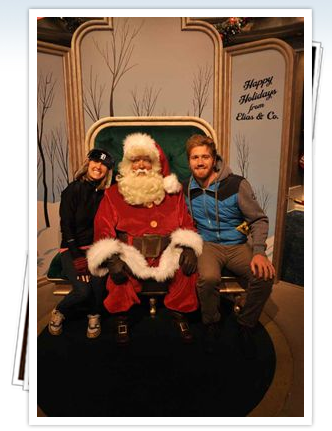 We grabbed some dinner, free chocolate, and then decided to head back over to Disneyland. When we walked in, we saw everything set up for the Candlelight Processional, which I TOTALLY forgot they were doing. If my memory serves me right (and the folks around us while we were waiting for it to start were telling the truth), it has only been open to the public for the last two years. Ryan and I got front row standing 'seats' and were able to watch. It was soooooo cool! The narrator was the AllState guy - what a great voice to read the Christmas Story! Like I said, I had totally forgot that it was going on, but we walked up at the perfect time and had the perfect viewing area. There were over 500 choir members singing beautifully! The pictures or video didn't turn out that great, but you get the idea. After I 'beat' Ryan at Buzz, we went over to the castle and walked up JUST IN TIME to see them lighting all of the icicles. They even made it snow during the process (although I couldn't get a good picture of the 'snow'). Of course we then had to ride the Wildest Ride In The Wilderness! Because of the rain I think we waited maybe 5 minutes, if that. Then we decided to head back to the castle for the fireworks. While we were waiting we saw a couple get engaged, which was super cute. But, alas, because of the rain and 'inclement weather' they actually had to cancel the fireworks - bummer! But since everything else worked out so perfectly, it was still a great trip! People may think we are silly or weird for going to Disney so ofter, but man, it is one magical place! Created by Michigan students for the incoming Class of 2017. Don't worry! We are all safe :) We were sleeping soundly when it occurred and didn't notice it (but some friends have said it did wake them up). 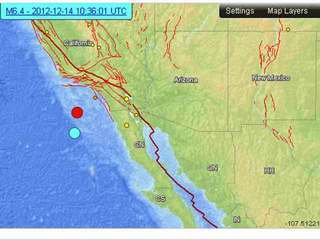 SAN DIEGO - A 6.3-magnitude quake shook the coast of Baja, Calif. Friday. No tsunami warning was issued. No reports of damages were reported. The earthquake was centered off of the coast of Baja, Calif. and struck at about 2:36 a.m. The location of the earthquake is 172 miles from Coronado, Calif.
10News viewers from Point Loma, Escondido, Rancho Bernardo, San Ysidro, El Cajon and other San Diego areas called in to say to they felt the quake. 10News will update this story as more information becomes available. Ryan and I are going to go to Disney tomorrow after work (we both get off around 2pm) because we want to see the Christmas lights and watch the fireworks. Since normally my longer outdoor run is on Friday, I had to switch it up and move it to today. Thankfully we finished our small group for the semester last week so I had the evening to be able to run. 1. Bathroom Break - Today my co-worker ordered some of my favorite food (CHIPS AND SALSA) from the Mexican restaurant downstairs. Normally I eat pretty bland food before my runs (apples, granola bars, PB&Js, oranges, etc), so I was slightly worried how all of the spice would do. There are quite a few port-o-potties along my route (since I run along the beach), but THANKFULLY I did not need one! I did taste the salsa a couple times with a burp here or there (I know, I am quite lady-like), but all-in-all the chips and salsa sat fine in my tummy. 2. The Sun - Normally my longer runs outside I try and do on Fridays, which is when I get off at 2pm, so I have a longer time before the sun goes down. I didn't take a lunch break today, so I took off work around 4pm instead of 4:30pm - but still, the sun sets pretty early around here and I was racing to finish before it disappeared. I was able to get back to my sidewalk portion of my route by the time the sun was hitting the clouds around the horizon. This was the sunset once I finished. It hadn't completely set, so I think I can say I beat the sun! 3. The Rain - A storm rolled in last night and has been lingering around. The dark clouds were threatening for most of my run, but the waterworks decided to hold off - whoo hoo! I actually heard that SD County got upwards of an inch of rain last night and that the mountains got up to 18 INCHES of snow! 4. My Garmin - I was actually planning on working out in the gym today, so I hadn't charged my Garmin since my run last Friday. I was down to my last bar of battery (it actually beeped at me a few times during my run reminding me I had a low battery), but I was able to finish before it died completely. 5. My Time - I have a 10K on Sunday (which is 6.2 miles for those of you who aren't sure) so todays 6 miles I wanted to do fairly relaxed. When I looked at my time for the first 2 miles, I realized that I was under 9:30 per mile and my legs felt great. I decided to see if I could finish my 6 miles with an average time between 9 and 9:30 minute miles. From the looks on my Garmin I hit right about 9:06 per mile - not too shabby - which hopefully means I will be able to run sub-9 minute miles for my race on Sunday. Before it shut off due to lack of battery charge. End of The Year Gift?! 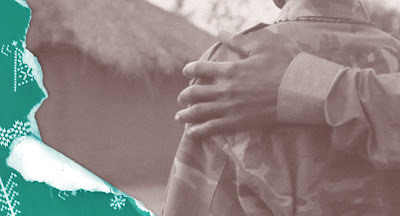 Are you looking for a charity to donate to before the end of the year? Looking for a non-profit that you can give towards in honor of a friend, family member, loved one, etc? The American Foundation for Suicide Prevention is a great organization and would LOVE to put your donation to great use. 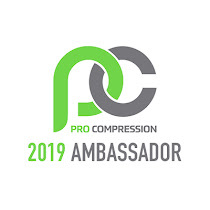 I hope you will all consider supporting this great cause. Any contributions will help the work of AFSP, and all donations are 100% tax deductible. Click on this link for an easy way to donate. 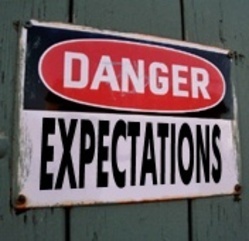 This post could be about some many things – expectations we hold our friends to, family relationships, expectations we are held to at work or even those we hold our co-workers or employers to, expectations we have of strangers around us, but this post is actually not about any of them. This post is about having realistic expectations of myself for workouts, specifically over the holidays. I, like many others, will be traveling for the holidays. 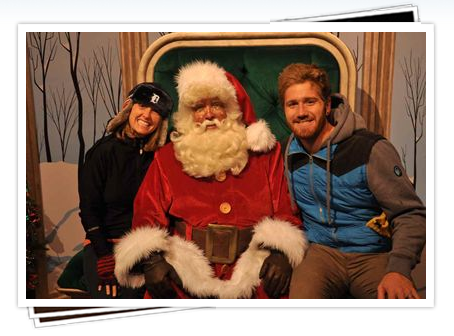 Ryan and I will be heading back to Michigan for a week for Christmas. During that time we have many activities planned. 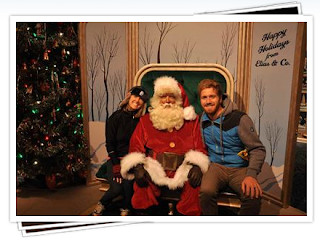 We will be seeing both his family and mine (along with a visit with both of my grandmas), going to a hockey game, going to the zoo to see the lights, going to Greenfield Village for their December Nights exhibit, etc (I am sure you get it, a lot of ‘going’). 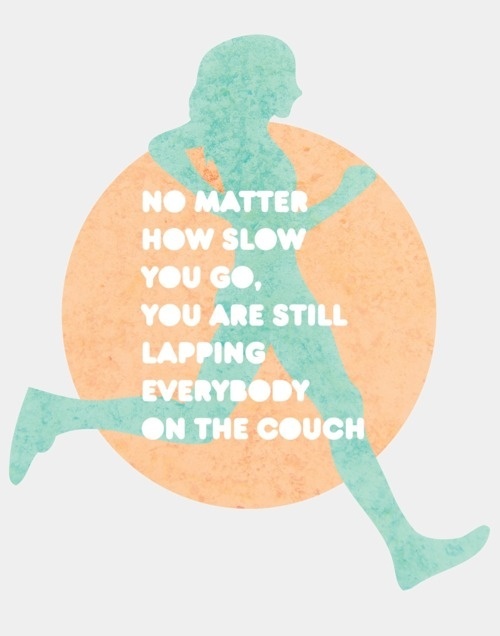 Now along with all of the going and doing, I want to make sure that I am sticking with my workouts – especially since I will have a 15K the week after we get back, a half marathon a couple weeks after that, and another half marathon a month after that. Right now it is easy for me to get into a routine – I go to work all day, then go work out for an hour, then go home, take a shower, start to make dinner, get stuff around the house, eat dinner with the hubby, relax for a little bit, and then do it all over the next day. Of course I want to stay on a training schedule over the holidays, but I think it might be unrealistic for me to think I am going to get a workout in every day. Thankfully my parents have a treadmill that I can use while I am there and I am planning on at least one outdoor run. (I just have to figure out what to wear for those crazy Michigan winters) I am sure I can ‘count’ some of the other activities that we do as workouts – like sledding – but I am still going to try and stay diligent with staying active and working out when I get a chance. What are your realistic goals for working out/ staying healthy over the holiday season? 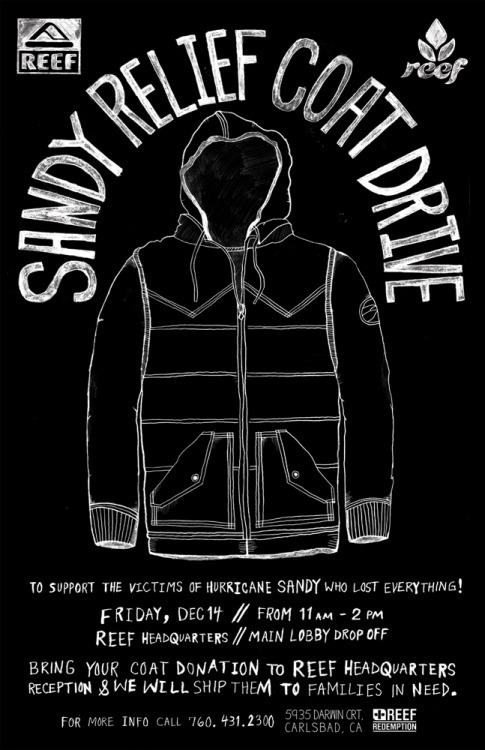 To support the victims of Hurricane Sandy who lost everything. Bring your coat donations to Reef Headquarters reception and we will ship them to families in need. Winter holidays are the time for sweet indulgences, so what better time to share this goodie – perfect for splitting around a fire pit or the kitchen table? Give everyone a spoon and dig in! 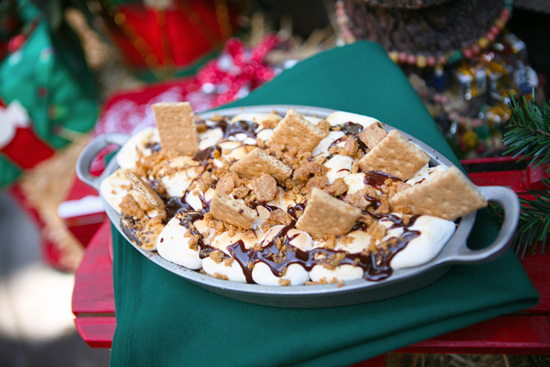 This gooey, oft-ordered wow of a dessert is a collaborative effort at Big Thunder Ranch Barbecue at Disneyland park, on the menu for just a few months. Chef Craig Orrell created the recipe with Chef Toby Hollis and theDisneyland Resort Central Bakery team. We think it’s the perfect taste of childhood for this time of year. Preheat oven to 375°F. Spray a 9×13 cake pan with cooking spray. Prepare brownie batter per package directions and pour into prepared cake pan. Bake 20 to 22 minutes, or until a wooden pick inserted in the center comes out with moist crumbs clinging to it. Place marshmallows over brownies. Leaving oven door ajar, place marshmallow-topped brownies under broiler 1 1/2 to 2 minutes or until marshmallows are golden brown, watching very closely to avoid burning. Take half of the graham crackers and break them into planks; crush other half of graham crackers into crumbs. Sprinkle crushed graham crackers over top of toasted marshmallows, and place graham cracker planks randomly into toasted marshmallows. Serve immediately.